As she did every evening after an arduous day at the rubber plug factory, Eunice sat at the table in her kitchen-bedroom and slowly ate a sack of hazelnuts, raw but removed from their shells. She did so as the result of her incorrect belief that the nuts would prevent pregnancy. The nuts’ supposed contraceptive powers had been explained to her at length by Mr. Castaneda, the hazelnut vendor, whose children’s private school education was being partly funded by Eunice’s unusual diet. It should also be noted, however, that the school itself was neither especially expensive nor especially good — because really, how much profit can one make of one gullible hazelnut customer? — and, also, that only two of the three Castaneda children — Filberto and Pinola — were offered this moderately improved education, as Mr. Castaneda had concluded that such opportunities would have been wasted on his youngest, whose name, it must be noted, was Hazel. Nonetheless, the expense of sending one’s older, smarter children to even a moderately priced school is considerable, and that fact alone should give you some indication of Eunice’s monthly hazelnut budget. Indeed, when Mr. Castaneda heard of Eunice’s desire to avoid having a baby, he was more than happy to embellish the virtues of hazelnuts beyond mere thiamine to include magical baby-repelling substances that, technically, no one had told him did not exist. Furthermore, Eunice only desired to prevent possible pregnancy as a result of words spoken by her dying mother. “Eunice, you were not meant to have children. I hope you believe me when I tell you this. That right there,” said Eunice’s mother as she pointed at Eunice’s belly, “is good for food and that’s about it.” Eunice had assumed proximity to death had given her mother precognitive powers and that any offspring would wreak some fiery evil upon the world. Everyone else standing at the dying women’s bedside correctly assumed that that the proclamation stemmed from the honesty that only encroaching death can permit. The third and final factor that led to Eunice’s daily hazelnut ritual was simply that Eunice has learned nothing of the female reproductive system — not only because her mother chose not to do so and hope for the best, but also because, unlike Filberto and Pinola, Eunice was never given the opportunity of a good education. No, Eunice — like poor, dumb Hazel Castaneda — lacked what her mother termed “a head good for thinking,” which in turn meant she lacked “a belly good for babies” and any proper explanation for how better-suited mothers-to-be actually get a baby inside. Thanks to an expression wholly appropriate for a woman of her specific mental abilities, Eunice had no suitors and was in no danger of becoming accidentally blessed with child. Her ignorance of all matters related to babymaking, however, left her all the more concerned. In her mind, she could become pregnant through the most casual of interactions with men, though one in particular haunted her: As she began her shift at the plug factory, pulling the lever that forced the stamp again and again into the squares of warm, soft rubber that would scoot down the conveyor belt, Eunice could only think of Horace, a leering pig of a man who worked the preceding shift at Eunice’s station and whose manipulation of the same lever could cover the thing in the goop or dust or bugs that cause babies to grow in women’s bellies, for all Eunice knew. For these reasons and possibly some others that only she would understand, Eunice crunched through the sack, nut by nut, all as a result of her misguided effort to occupy her internal real estate with tenants that, however temporary, would block babies out. Today, however, would be unique, though it would Eunice even mention to anyone the incident that made it so. The hazelnut’s words caused Eunice’s brow to furrow. “You’re a hazelnut,” she stated, as if that somehow made the hazelnut’s claims untrue. “Yes, I am, but I am also a thinker and a believer and a creator and a lover, just as what you do defines you,” the hazelnut continued. “Well, I am a human! I’m not — I’m not a hazelnut or something,” Eunice retorted. 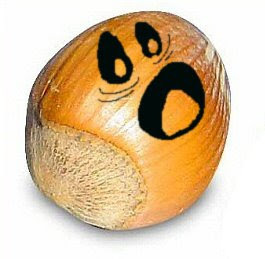 This talking nut had begun to anger her. Though she was not sure why, she suspected it was that he was insinuated that she was a nut. And she was not a nut. She was certain of that. Eunice’s brow softened. She began to realize the gravity of the situation. “Can you all talk?” she asked slowly. “That’s not true at all!” the hazelnut replied. Eunice looked directly into the hazelnuts small eyes, and then towards the sack of his comrades, who slowly began chiming in with “He’s right!” and “Listen to him!” and the like. She then looked back at the hazelnut in her fingers and, for the first and possibly only time in her life, a clever train of thought began chugging through her head. “That exactly what you would say if you wanted me not to eat you,” Eunice said with a smile and nod. Tragically, she was right, and though she’d never before caught on to anyone else trying to mislead or deceive her, she was quickly convincing herself that she this time had the jump on someone — even if that person was a talking nut. In Eunice’s head, no smart-talking hazelnut would get the better of her. And with that, she placed that first talking hazelnut into her mouth and bit down, allowing him only a moment to scream. She continued her Friday ritual as usual, doing her best to block out the sobs and curses of the remaining nuts as she ate them one by one. Eunice was quite pleased when, the following morning, her belly had once again not become fat with child overnight. And when she visited Mr. Castaneda’s stall at the market that next Friday afternoon, she inspected the bag carefully, finding it to be more like other bags she had purchased and far less talkative that the previous night’s. She never spoke of that night, though specifically for the reason that she remembered it as the occasion on which she was quite nearly outsmarted by a nut. The fact that a nut spoke and that hazelnuts specifically have a culture that they at least consider that they keep invisible to the eyes of humans, however, did not and has not since struck her as particularly remarkable. AN EXPLANATION: The vast majority of little nothings that I write never get published here, mostly because they lack an ending. This managed to find as much of an ending as it possibly could have. So now you can read it in its entirety if you so choose. I always very much liked your writing, Drewseph. You should post more of your stories, even if they don't have endings. By the by, did you ever polish your "novella"? Or did you leave it lying about on a computer somewhere like I did mine? Bri, that is honestly so nice of you to say. I enjoy your writing too. I have no idea where this came from. I thought of it in the shower and wrote the whole thing in one sitting. On some level, I blame Pushing Daisies, probably for reasons I'm not aware of but mostly because in my first version, Eunice was "Elsa" and the mother was "Eunice Senior." I may publish more fiction here, if only in an effort to make me better at it. Nothing ever came of my novella, and I don't think it's particularly good now. However, I think a few parts in it are good and that that class and that project in particular taught me a lot about writing fiction. I second Bri's request. I like this story. It's far superior to my own aborted attempts as not only does it have an ending (of sorts), it has a plot (of sorts). Here here and what not.